In 2014, the Converse County Conservation District (CCCD) Board of Supervisors requested that the Wyoming Water Development Commission (WWDC) conduct a comprehensive study of the Middle North Platte – Glendo Watershed and its water resources. The Level I Study was recommended to the Wyoming Legislature and funding was approved in 2015. RESPEC of Cheyenne, Wyoming was contracted by the WWDC to complete the study. The purpose of this voluntary comprehensive study is to evaluate watershed conditions, needs, and opportunities on irrigated lands, rangelands, wetlands, and streams. The study will also help in identifying water supply needs and provide the CCCD and the Platte County Resource District (PCRD) with a watershed plan that outlines potential improvements in partnership with area landowners. The Middle North Platte–Glendo Watershed is located in the eastern portion of the Pathfinder to Guernsey Subbasin of the Platte River Basin in eastern Wyoming. 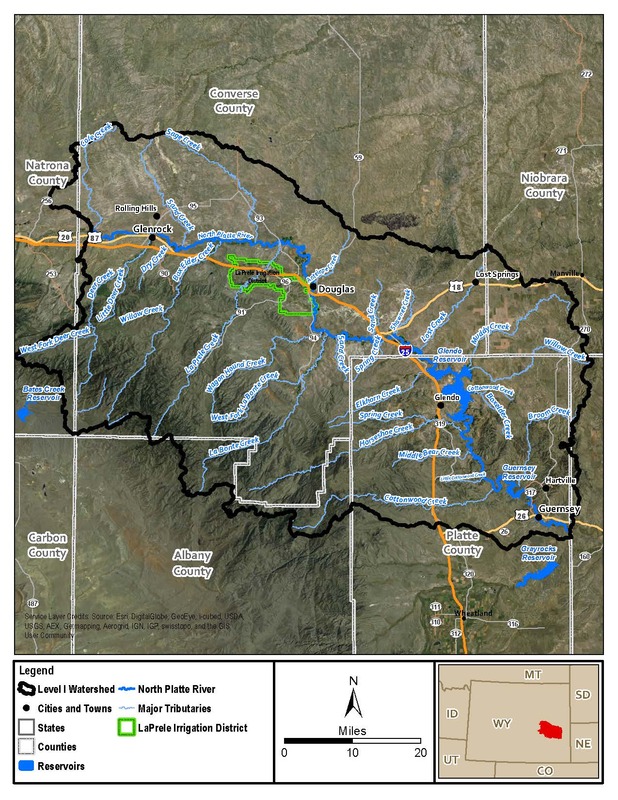 The Level I Study area for the Middle North Platte–Glendo Watershed includes the watersheds for the North Platte River, and its tributaries Box Elder, Broom, Cottonwood, Deer, Elkhorn, Horseshoe, LaPrele, Muddy, Sage, Sand, Wagon Hound, and Willow Creeks. The study area covers approximately 3,275 square miles or 2,095,807 acres and is primarily located within Converse and Platte counties with small portions in Albany, Goshen, Natrona, and Niobrara counties. The city of Douglas and the towns of Glendo, Glenrock, Guernsey, Hartville, Lost Springs, and Rolling Hills are located within the watershed. Agriculture, uranium extraction, oil and gas development, power generation, recreation, and tourism are major industries within the study area. More than 80 percent of the study area is rangeland covered with grasses and shrubs. The remaining portion of the watershed is irrigated pasture and hay, forest, dunes, riparian/wetland, and developed lands. There are approximately 55,150 acres of irrigated lands in the study area, which are located along the North Platte River, Cottonwood, Deer, Horseshoe, La Bonte, La Prele, and Wagon Hound Creeks. Most of these irrigated acres are located with the LaPrele Irrigation District (LID). Land management in the watershed consists of 75.4 percent or 1,581,950 acres under private ownership, 12.0 percent or 251,260 acres managed by the State of Wyoming, and 11.3 percent or 237,487 acres managed by federal agencies. Approximately 62.8 percent of the watershed is located in Converse County, with 24.8 percent in Platte County, 4.7 percent in Niobrara County, 4.6 percent in Albany County, 2.1 percent in Natrona County, and 1.0 percent in Goshen County. In 2015, RESPEC started to compile available data on the watershed into a Geographic Information System (GIS) geodatabase and past reports about the watershed into a digital library. These datasets and reports will be incorporated with field data collected during the study to create a watershed management and rehabilitation plan. This plan will outline potential projects involving irrigation system rehabilitations, livestock/wildlife water source developments, and surface water storage enhancements, along with stream channel stability improvements. Projects that provide for Stream channel stability, water quality improvements, or erosion protection. Since the meetings were held, RESPEC staff has been visiting with interested landowners about potential project sites within the watershed. In the March and April of 2016, open houses were held in Douglas, Wheatland, and Lusk. More than a dozen landowners attended the open houses to share information and discuss potential projects. Also, during the spring and summer of 2016, more field visits with interested landowners about potential projects were completed. In the fall of 2016, a draft report of the study findings and watershed plan with potential projects will be created by RESPEC and reviewed by the WWDC, CCCD, PCRD, and participating landowners. With the completion of this study, landowners within the watershed will be eligible for grant funding through the WWDC Small Water Projects Program. If you are interested in learning more about the watershed study, discussing your questions and concerns, or participating in the watershed study, please contact either Justin Krajewski with RESPEC at 605.877.2134 or Justin.Krajewski@respec.com or Michelle Huntington at 307.624.3151 or Michelle.Huntington@wy.nacdnet.net. RESPEC works on solving ecosystem problems at a watershed level. Their collaborative expertise of technical skills and management experience assists the development of innovative, economic strategies to decipher and improve watershed management and ecosystem restoration. RESPEC offers integrated, cost effective, and practical solutions to each individual participating in a study. Their strategic approach to watershed management is constructed by their strong scientific foundation to assist in knowledgeable decision made from each party. For more information on RESPEC you can visit their website at the link at the top of the page.